Discover amazing comfort and style with Kaos silicone skin eyelets. These ultra-thin flesh tunnels are the most comfortable stretched ear jewellery you will ever wear and they look gorgeous too. 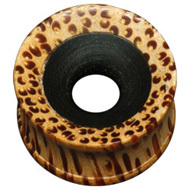 Kaos silicone skin eyelets are super-lightweight flesh tunnels with a flared, concave shape. They hug your ears and make your stretchings look bigger, while the flexible silicone means that they move with your body. 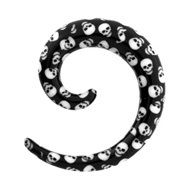 When it comes to silicone stretching jewellery, Kaos are the only choice. The flexibility of Kaos’ eyelets makes them extremely comfortable to wear – especially for sleeping and under big headphones. 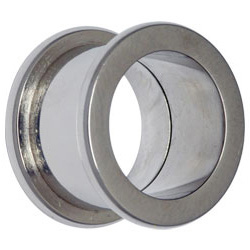 The soft eyelets bend around your ear and do not dig into your skin the way that a rigid tunnel can. Light, soft and flexible, you’ll forget that you are even wearing them! Kaos’ classic silicone skin eyelets form the core of their range and they come in seven stylish colours. They include black, white, pink, blue, violet and clear. 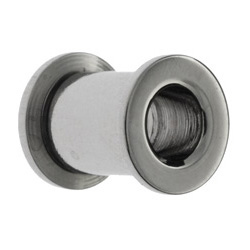 All of these eyelets look great but in my opinion the clear eyelets are really special. 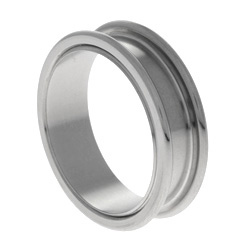 They are practically invisible but give your stretchings a nice round shape, so you get a clean “no jewellery” look without the puckering that most of get when we remove our tunnels. Part of Kaos’ latest collection, their pearl silicone skin eyelets give you a choice of colours with a beautiful pearl finish. The finish makes them really catch the light, without actually looking pearlescent. These eyelets are available in Royal Purple, Jade, Cobalt, Sky Blue, Shell Pink, Sea Foam, White Pearl, Sea Blue and Hot Pink. 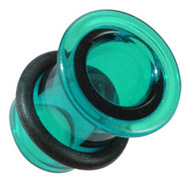 The colours are really rich and dimensional, making the pearl eyelets my personal favourite of Kaos’ silicone eyelets. 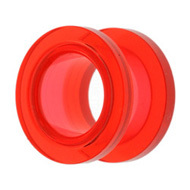 And for the ravers amongst you, check out Kaos’ UV range of silicone skin eyelets. 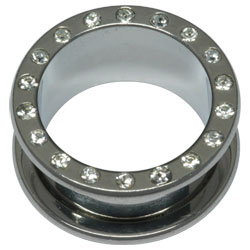 These super-bright eyelets glow under UV light and come in amazing colours that look electric even in daylight. This range is more opaque than the others and the colours have to be seen to be believed. 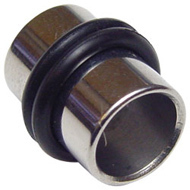 The UV eyelets are available in Purple, Orange, Magenta, Green and Blue. 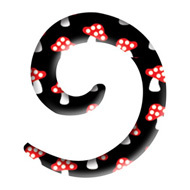 This entry was posted in Silicone Body Jewellery, Stretching Jewellery and tagged kaos, kaos eyelets, Kaos Flesh Tunnels, kaos silicone, Kaos Silicone Skin Eyelets, kaos softwear, kaos tunnels on August 9, 2013 by Piercing Guru. 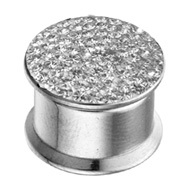 Discover a new kind of bling with our new range of crystalline box flesh plugs. The front of these flesh plugs unscrews to reveal a tiny secret compartment. They feature amazing crystal-set designs with stunning sparkle that really lights up your look. 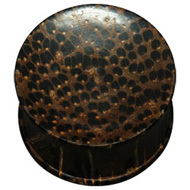 Our new box flesh plugs are available in eight gorgeous designs, including zebra print, rainbow colours, a black star and the three you can see below. The crystals are truly amazing and have a really bright, clear shine. They catch the light beautifully and add a big dose of glamour to your outfit. 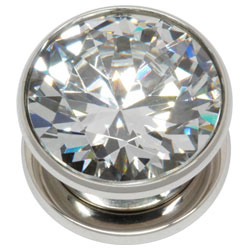 Our crystalline box flesh plugs are made of high quality surgical steel. They are non-irritating, lightweight and very comfortable to wear. These flesh plugs are double flared, so they stay firmly in place. It does mean that they are more comfortable to insert into healed stretched piercings rather than fresh stretches. 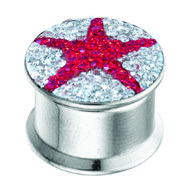 Bright, bold and comfortable to wear, our crystalline box flesh plugs are a great way to up the glamour stakes. 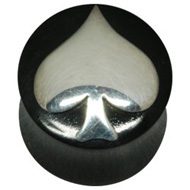 This entry was posted in Stretching Jewellery, Surgical Steel Body Jewellery and tagged Crystal Flesh Plugs, Flesh Plug, flesh plugs, Jewelled Flesh Plugs, Steel Flesh Plugs, Surgical Steel Flesh Plugs on May 7, 2013 by Piercing Guru. 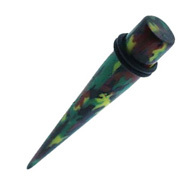 Stretch your ears in eye-catching style with our new patterned acrylic ear stretchers. 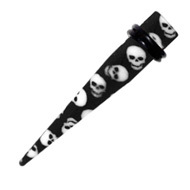 These stretching tools come in three graphic patterns that make a cool alternative to plain ear stretchers. They are made from high quality PMMA acrylic, a lightweight plastic that is non-irritating and feels very comfortable to wear. 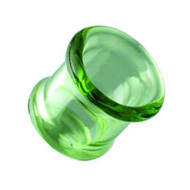 With their smooth finish, these ear stretchers slide gently through your piercing without dragging. They allow you to stretch at your own pace, slowly enough to allow your body to heal in between stretching. 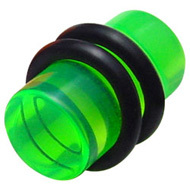 We also have a huge choice of other acrylic ear stretchers including plain black and ultra-bright UV colours. 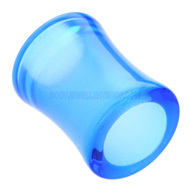 Our acrylic ear stretchers come in two styles: straight and spiral. Below you can see the three new spiral designs. 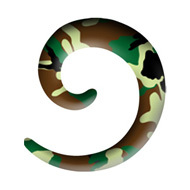 Spiral ear stretchers are easy to handle and you gently rotate them through your ear. 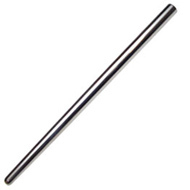 Their rounded shape looks really striking and won’t poke into your neck, as some straight tapers can. 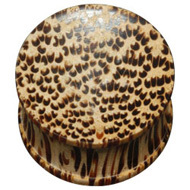 They make a big, bold statement and really show off your ear stretchings. 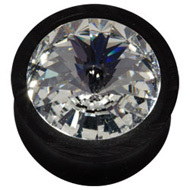 Below are our three new straight acrylic ear stretchers. They have a classic taper shape and come with two black O-rings to keep them in place. This shape is more compact and gives a more streamlined look. 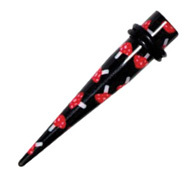 These ear stretchers have rounded points, so they are comfortable to wear and lie straight behind your ear. 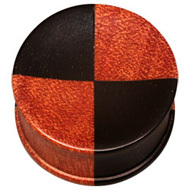 Simple but eye-catching, they are a classic choice for stretching your ears. 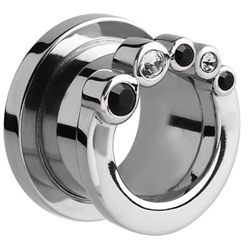 This entry was posted in Acrylic Body Jewellery, Stretching Jewellery and tagged Acrylic Ear Stretchers, Ear Stretcher, Ear Stretchers, Stretching Pin, Stretching Tapers, Stretching Tools on April 30, 2013 by Piercing Guru. 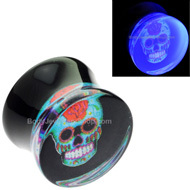 Show off your stretchings with a pair of glowing UV flesh plugs! 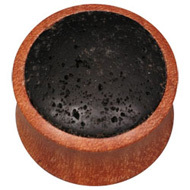 Our UV plugs are made of UV-reactive materials that glow brightly under UV light and black light. They come in a great choice of styles and designs, from simple UV eyelets to gorgeous patterns and ultra-bright colours. 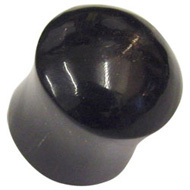 UV flesh plugs are usually made of PMMA acrylic or silicone. 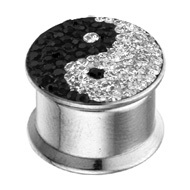 Both these materials are great for body jewellery and both have different pros and cons. Acrylic is a great value option that is light, durable and non-irritating; while silicone offers flexibility, softness and comfort. 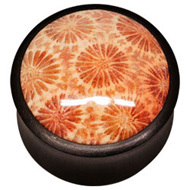 Our solid UV flesh plugs offer you amazing colours and designs. 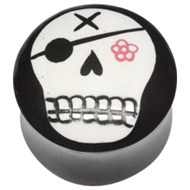 Choose from plain plugs like the one on the right, or eye-catching designs like our anchor and Mexican skull plugs. 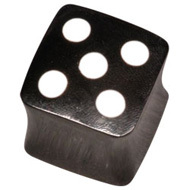 The anchor design is also available in black. It’s important to remember that black does not glow under UV light, so only the white, clear or coloured parts of the flesh plug will actually glow. 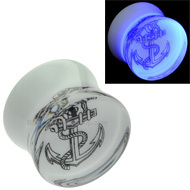 We have over 50 UV flesh plugs to choose from, so you can’t go wrong! 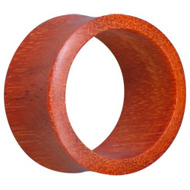 If you prefer flesh tunnels, we have a huge choice of UV flesh tubes, eyelets and tunnels. 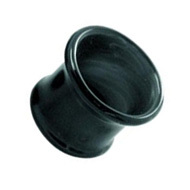 This includes our best-selling Kaos silicone eyelets, one of which you can see below. 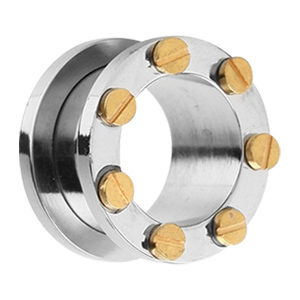 The Kaos eyelets come in 5 different colours, as well as a bigger number of non-UV colours. 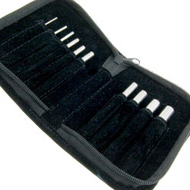 They are very soft and give you an extremely comfortable feel, especially at night. This entry was posted in Stretching Jewellery, UV Body Jewellery and tagged Acrylic Flesh Plugs, flesh plugs, UV Body Jewellery, UV Flesh Plugs, UV Jewellery, UV Stretching Jewellery on April 5, 2013 by Piercing Guru.